Former MDC Spokesman and Leader of an NGO called Free & Fair Foundation Gabriel Chaibva has sensationally claimed that MDC youths had a pistol and since they did not know how to use it, 2 of the youths then accidentally shot each other and they died during the 1 August politically killings. He was testifying in front of the Kgalema Motlantle commission of inquiry. Said Chaibva, "My informant told me that they saw some MDC Alliance youths with a pistol and they were trying to use it and accidental shot each other and two of them are likely among those whose bodies were dumped at Parirenyatwa hospital. They likely shot themselves playing around with the pistol. They were not shot at by the army. "The 1 August events were planned by MDC Alliance that is why they invited criminals from Kenya to assist them so that they may push for a Unity Government as was done in Kenya after the violent elections. "Your Excellency I saw MDC Alliance youths on August 1 in the morning being given hot stuff at their HQ. l also a lot of smoke and l do not think it was from our normal Madison. "Our investigation also established that a businessman discharged his gun by mistake when confronted by demonstrating youths. We could not establish if anyone died from the discharge but it may be possible that some bodies were a result of that discharge." Chaibva further told the commission that the happenings deaths on August 1 is exactly what MDC Alliance wanted. "They wanted nothing short of dead bodies to push their agenda. They had a clearly defined agenda to discredit the new government and for Americans to keep interfering." 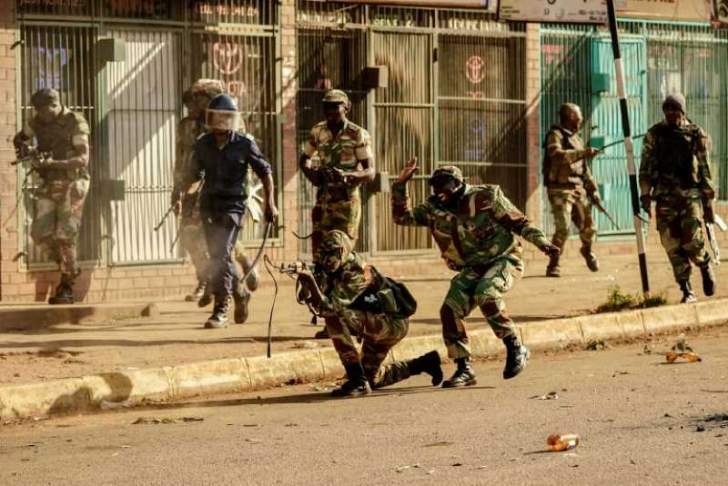 The Former MDC Leader shocked the commission when he said discharge of guns by the military on Jason Moyo could not possible have killed anyone. "I saw the kneeling soldier with my own eyes. After the alleged shooting towards protestors I checked the area and did not see any dead bodies. I was walking alongside South Africa's #ENCA reporter Thulasizwe Simelane who was capturing the events near ZEC Headquarters. "MDC is a violent party and anyone who underestimates the militancy of the MDC does so on their peril."